Posted on April 25, 2014 April 25, 2014 by Heather W.
A special thanks to Nostalgia Electrics for providing the Miss Frugal Mommy blog with a product for free in exchange for an honest review! The days are getting warmer, summer is almost here and my children are constantly begging for ice cream for dessert. While I believe the occasional summer stops to the local ice cream shop are a must, having ice cream for dessert every night is not. So what is the healthiest alternative to ice cream, something that embraces summer and cools you in the heat? 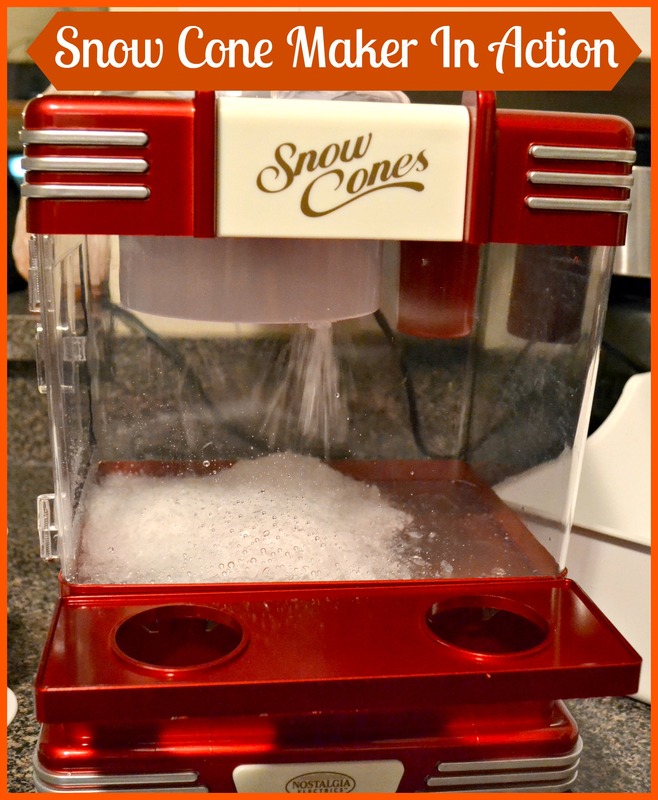 Snow cones of course and making them at home has just gotten a whole lot easier! 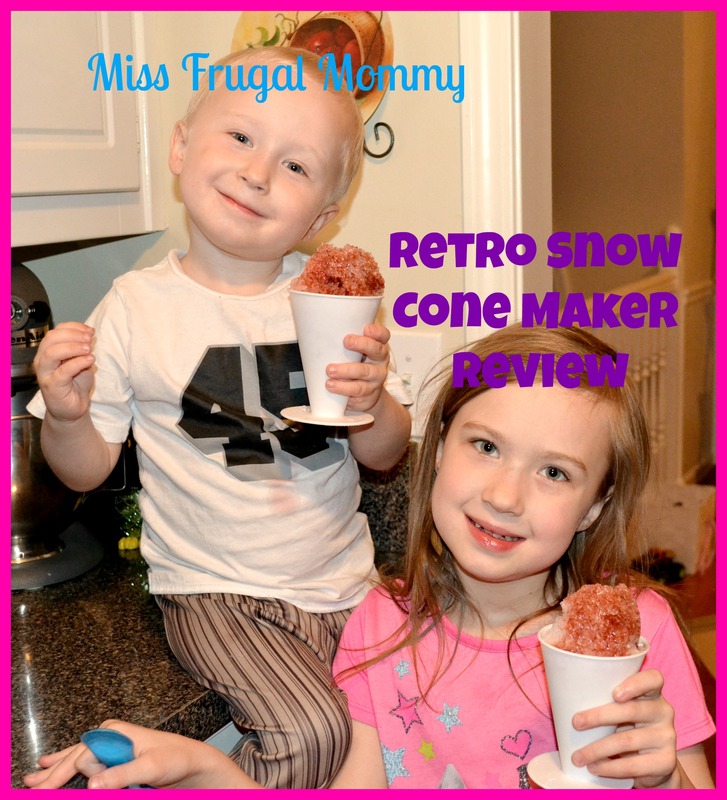 My children and I recently had the opportunity to review the amazing and fun Retro Snow Cone Maker. This attractive piece brings a unique look to the kitchen and an appliance I certainly feel proud having displayed on the counter. 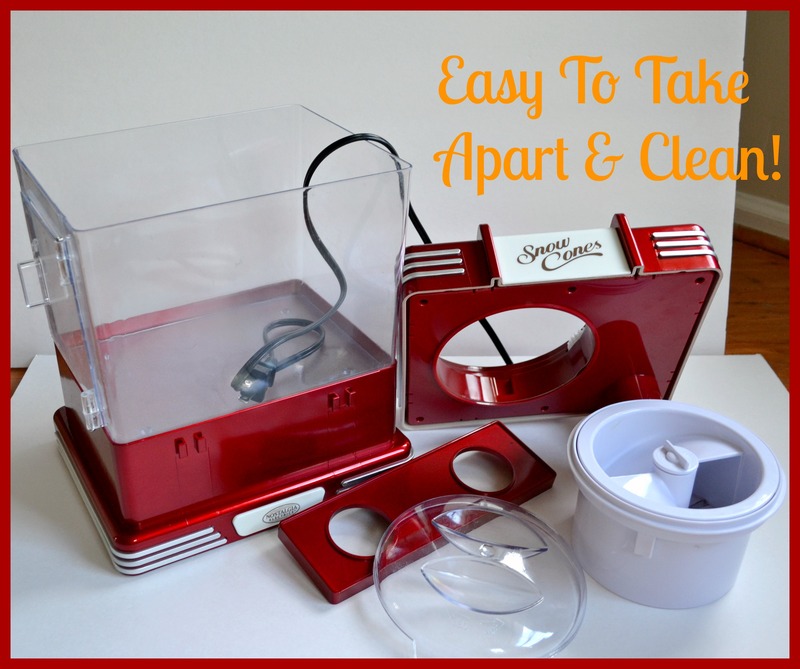 It comes apart easily for fast and convenient cleaning, and doesn’t require any maintenance. The major question though is how well does it work and to answer that, let’s walk through the steps of creating your delicious snow cone! Putting the snow cone maker together is a cinch and as you can see from the image below, there are only a handful of pieces in total. The first step in the snow cone making adventure begins with the ice. 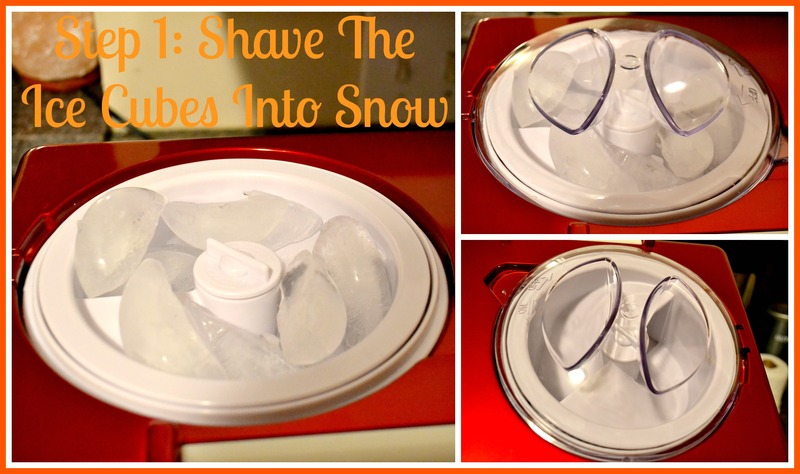 You load pieces of ice into the top and for safety, it will not begin shaving it until the top is clicked in place. The ice shaves very quickly and depending on how many snow cones you will be serving, only requires you to fill it with ice cubes a couple of times. We have an ice cube maker in our freezer and always have it filled for this special snow cone making occasion! Just look at the ice turn to snow! My children are absolutely mesmerized by this process of snow cone making and yell in delight as the shavings start to fill up the snow cone maker! This step is also quite loud, but you are shaving ice into very small pieces and I wouldn’t expect this to be a quite process at all. I personally like to think of this as my “quite time” because I can’t hear a single request my children are demanding of me, hehe! Before you know it the snow cone maker is full of beautiful white ice and ready to be scooped into cones! The best part about the next part is that I am in full control of what syrup or flavoring I use. This is my opportunity into making my kids think they are totally being spoiled with a dessert, when in actuality they are getting a healthy treat. They also don’t melt anything like messy ice cream, nor leave my children icky and sticky. You can get so fun and creative with creating colors for your snow cone and it’s always great to see my children’s reactions when they see what I have made. 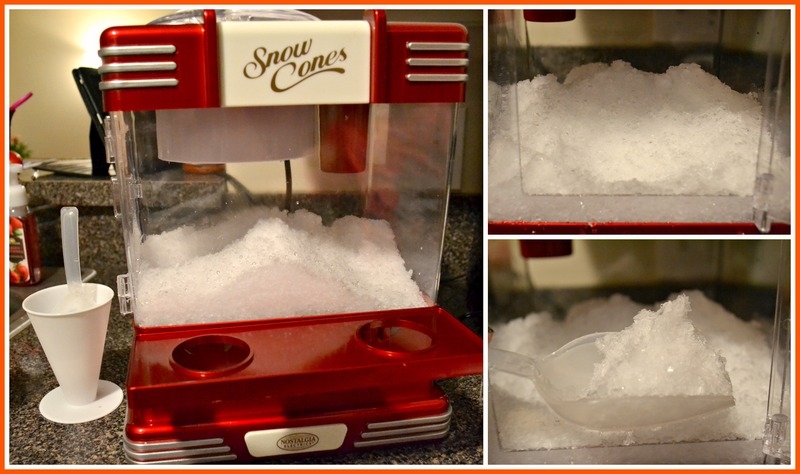 We just love this snow cone make and literally use it almost every single night. My children are always asking me if they finish their dinner, will I make them snow cones? This has turned into a nightly tradition and I am so happy to have discovered such a wonderful product! Here are my children thoroughly enjoying a round of fresh snow cones, they certainly seemed pleased if I do say so myself! Nostalgia Electrics offers a great variety of products for all your family’s entertaining needs. If you would like to purchase the Retro Snow Cone Maker for yourself, it can be found sold online at dozens of stores, including Amazon. This looks so cool! I would love one for my kids! This is the coolest thing ever. I love sno cones at my ripe old age of 59 and so do all my 6 grandchildren. This would get lots of use at my house. My family has always wanted one of these- they look so old timey! My kids always go for a snow cone at zoos and fairs and how fun it would be to have them any time at home. You are right about not having ice cream every night- but this is a wonderful alternative- great product! Nostalgia Electrics does have a lot of great products. This looks really cool to have. My kids always want a shlushie or a snow cone. I have 3 kids who would love to have this. I love how simple this is to use. I just love this, it would be great for barbeques and birthday parties. I spent more money as a kid at the ballpark buying snow cones that winning this just might mean I will break even,seroiusly I spent a lot of money. This would be so much fun making snow cones with my grandchildren. I was glad to see that there wasn’t a whole lot of pieces to putting it together. That means I can put it together myself. i love all the pictures you provided and the details, seems super easy to use even my kids could use it on their own, with me there of course though, but they’d be able to manage it without my help! LOL thanks for sharing! Thanks so VERY much for sharing this fabulous review! I love this type of thing and snow cones were my total fave as a kid!!! I always was partial to grape! Thanks again! I had a snow cone maker when I was a kid, nothing as nice as this ( it was the early 70’s) but I absolutely loved that thing. I think my grandkids would really like this a lot. Thanks for the review. This would make lots of happy kids this summer. I remember buying them for the kids at carnivals and even for awhile out ice cream truck had them. Always a hit! I love, love, love snow cones. I know it’s supposed to be a kid thing, but I just can’t help it. Loved your review, I wish I could get started doing reviews, but have no idea, how! Any tips on how to get started? I love writing and trying new products. I would love to have a Snow Cone Maker. I did not know you could use it to make yogurt snow or smoothies–awesome! 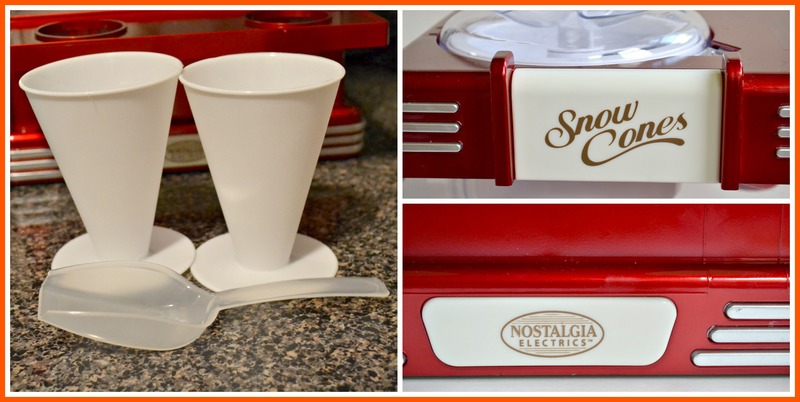 I love the look of this retro Snow Cone Maker–it would look really great in my kitchen. After reading your review, making snow cones is a lot easier than I thought it would be–I remember the awful task of shaving ice and making snow cones–definitely not for me. But I do love snow cones and would love to have this Snow Cone Maker. I remember growing up in a Japanese household & we always had shaved ice in the summer! It was a lot smaller though & only made a little bit for a little bowl of ice. I just remember it being sticky & yucky & the ice would melt all over the place and your wrist & arm would get tired after a while because you had to do it by hand. We would have to wait for our turn & the syrup was so sweet & sticky & sugary & expensive too! This sounds much easier to deal with & we can all enjoy our snow cones at the same time! Great on a hot summer day! My granddaughter had her very first snow cone a few weeks ago and now she can’t get enough of them! Problem is they are quite expensive even for the small size so I think I would be better off investing a machine of my own. Thanks for the great review. I LOVE that it is easy to clean because I was worried about that! You have good point about controlling the toppings/syrups and other ingredients. After all, it’s hard to object to just the frozen ice, but snow cones elsewhere can add some really objectionable stuff! Nice review. I would love to have this especially for the summertime when I have all of my grandchildren. They would love to be treated with snow cones. This looks like it would be great especially when it is really hot in the summertime. We have had shaved ice cones before and they were excellent. I know a local place that has wholesale flavor syrups so I’d love to have one of these to help stay cool and have something refreshing to eat this summer. David Smith recently posted…May Kindle Fire HDX Giveaways! This would be so great to have for the summer here in the hot NM desert. 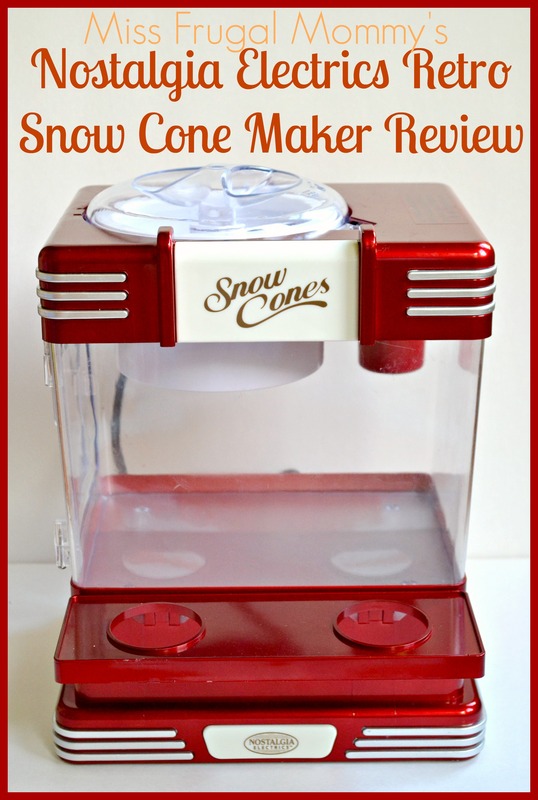 I’ve enjoyed snow cones forever and this snow cone maker is perfect for home use. I can tell by the pictures your kids love it and they must feel like the luckiest kids in the neighborhood! I love Snow Cones! This would have really come in handy last summer when I was pregnant and made my husband drive all over the county looking for a place that sold Snow Cones! 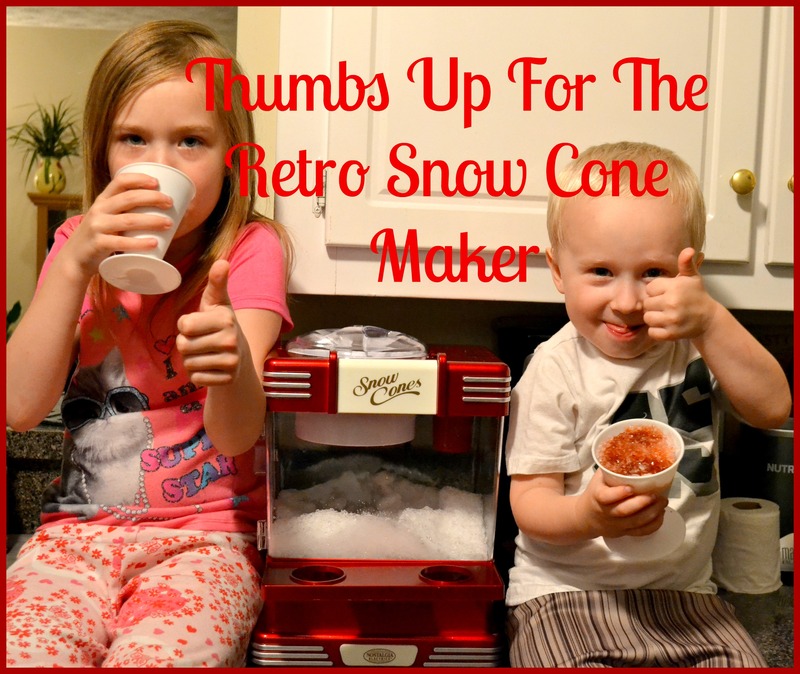 What a great treat for the kids and love the look of the retro snow cone machine. I would love to use this at cookouts and birthday parties. This looks like a fun machine to own! We would have a ball with it this summer during our BBQ’s, reunions and get togethers. Although I bet my son and I would love it EVERYDAY! I love icy treats- slushes, snow cones, etc. so would love to have this. Seems like a lot of fun for kids too! Absolutely love this….my boys are sno cone aficionados!! I used to have a Snoopy Snow Cone Machine. This looks much easier! Omg!I have wanted one of these so bad for so long. But,I am poor and can’t afford one. Please,please,please let me win this! This is the perfect item for a hot sunny day in Alabama! My whole family would love this! This is pretty cool and I think my family would love it!! My husband would absolutely love this! He is a huge snow cone fan. This would be great for the hot summer days! Thank you for your review. This snow cone maker is so cute and retro. I love that it is easy to clean. This snow cone machine looks very nice. Thanks for sharing!